Our weekend trip to Massachusetts extended our streak of low-hassle flights to four trips. We were right behind Cliff and Mariton on the flight out. We had a moiety of difficulty with the rental car; I didn't realize that we had to call to summon the shuttle to the rental car. (And I was disappointed that there was a shuttle involved at all, because I had chosen that rental agency specifically because it said "in terminal".) We had to drive for almost an hour to our hotel, but made it without difficulty. 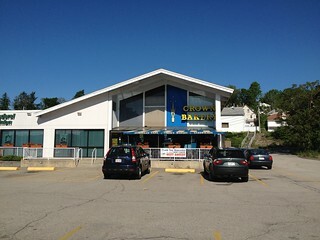 We were slower than we had hoped at getting to Crown Bakery, and everyone had left for the next stop by the time we arrived. But we decided to take a look around before catching up to them. 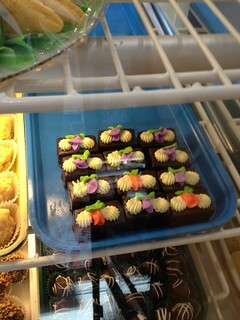 It was a very cute bakery, with a great many pretty things. I made my first breakfast a hearty corn muffin; Lori chose a slice of cake. 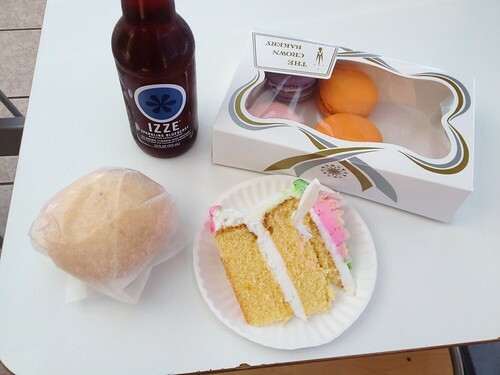 We each ate one of the jelly-filled macarons, and they were delicious as well as beautiful; unfortunately, the other two were wasted. At Acoustic Java, we met the group outside; I don't think we even made it inside. 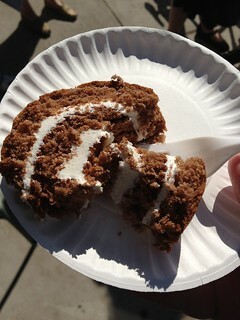 Karilyn offered us each a slice of the chocolate roll from Crown Bakery; the cake was very light with a delicate cream filling. 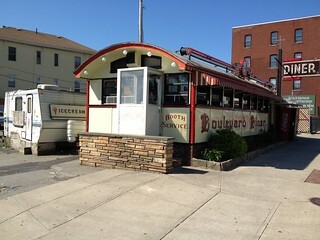 Our next destination: Boulevard Diner, a pretty diner with a wooden interior. We shared a booth with bethgrd and karilyn, and quite enjoyed our conversation. 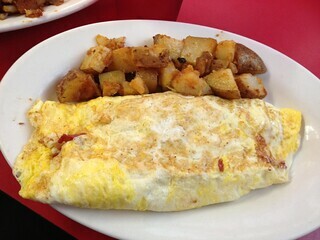 Lori and I shared the Holy Cross omelet, selected from a large selection of omelets named after local colleges, with pastrami, peppers, onions, and cheese. 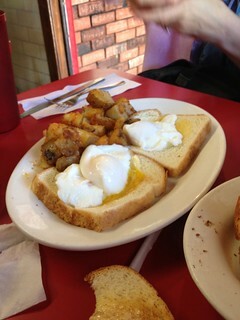 It was pretty tasty, but the accompanying potatoes were flavorless. Unfortunately, the waitress misunderstood our orders, and brought us two omelets instead of the one we had ordered, and brought Beth and Karilyn two plates of poached eggs and toast instead of one. The manager did almost exactly the right thing. The good thing was that she didn't charge us for the extra meals. The down side, though, was that she didn't tell us that she wasn't charging us, and she offered us the plates with an indifferent "We've cooked these extra plates…" So the two of us who didn't see the bill went off in high dudgeon in the mistaken belief that we were charged for food we didn't order. 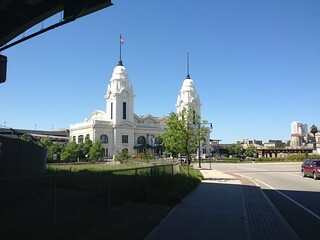 We strolled over to Union Station for a moment of digestion. 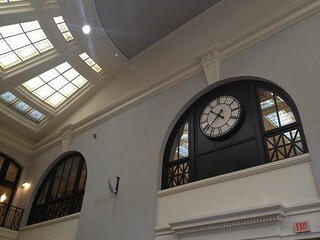 It's a beautiful building, but there was something (a restaurant that wasn't open at the moment?) 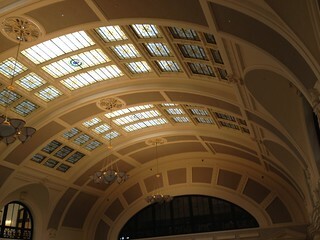 in the center of the large central room that spoiled the grandeur of that space. 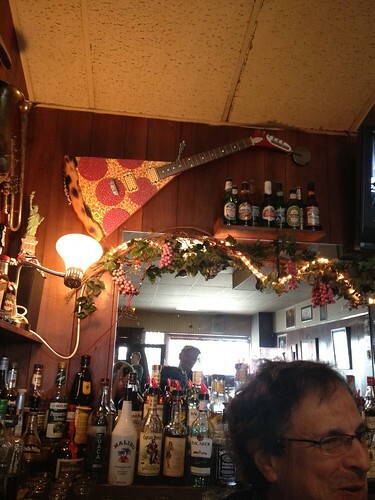 Our next stop was the Wonder Bar, a blast-from-the-past pizza joint with dark paneling and pictures of jazz and classic rock musicians. 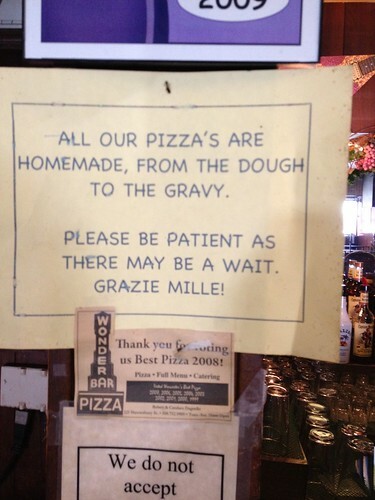 I took this picture because I've only read about tomato sauce being called "gravy", and I hadn't yet seen it firsthand. 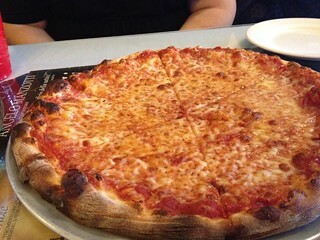 The pizzas were a classic thin crust pizza, with a good cheese and sauce. Lori says that the meatballs were just right. 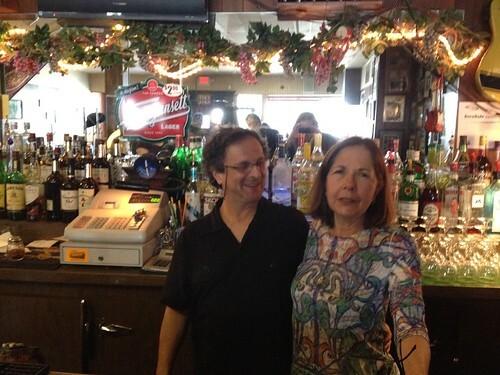 I got to chatting with Bob and Candy, who run the place. 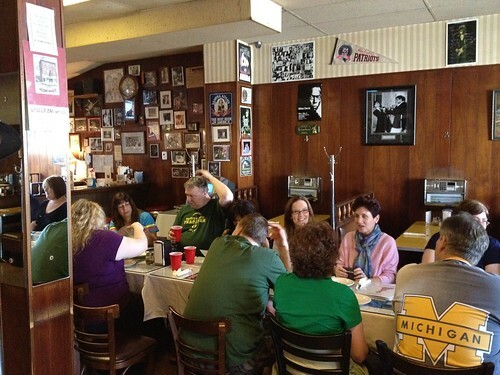 Candy pointed out the family in the pictures on the wall. I'm not sure of the exact dates, but the pictures showed that Bob had an uncle who died during World War II. 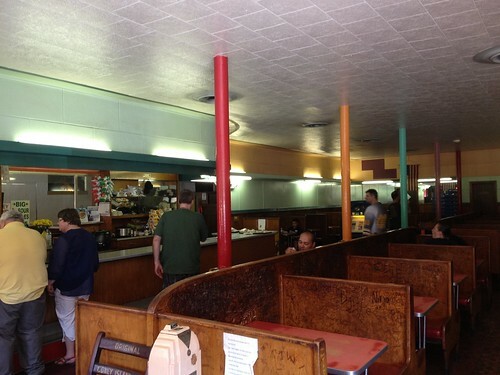 The pictures also showed our waitress, Gloria, who started working at the Wonder Bar during the 1950s, and is now 85. Even so, she's still spry and quite a card; Candy says that you shouldn't play cards against Gloria. It was hard to snap a picture of Gloria, because she didn't stop moving. As we started to leave, Bob said, "I try not to play favorites, but I like your hair," and he tossed me a Wonder Bar t-shirt. 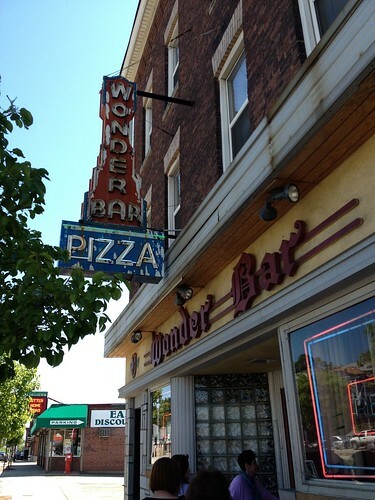 The Wonder Bar was one of my favorite stops on this tour for the family history and the chance to talk with the proprietors. 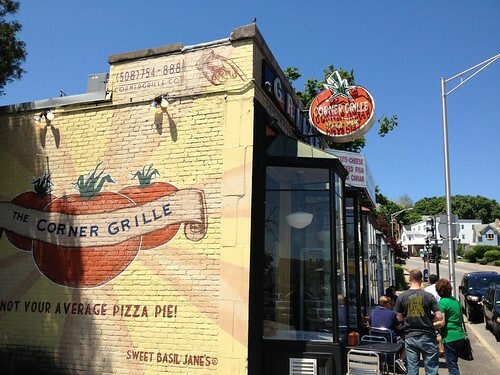 Corner Grille was a very different sort of pizza place; very much an artisan pizza place instead of a classic joint like Wonder Bar. When we arrived (we were late because of difficulties finding a parking place; this was a recurring theme of our whole weekend), there was a spread of dessert samples put out by some of the early arrivers. 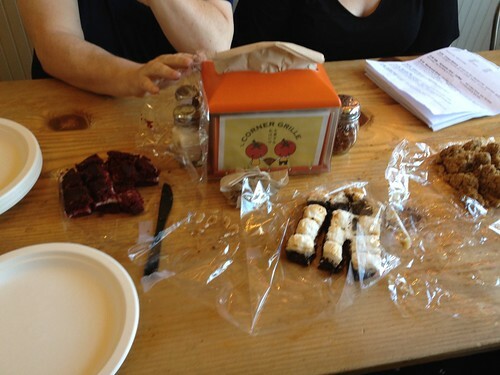 From left to right: red velvet whoopee pie, rocky road brownie, and molasses cream cookie. 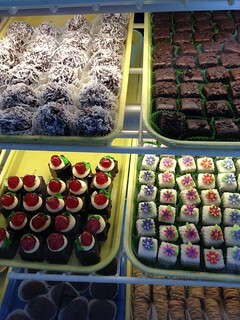 Of these, my favorite was the molasses cream, but Lori preferred the red velvet whoopee pie. 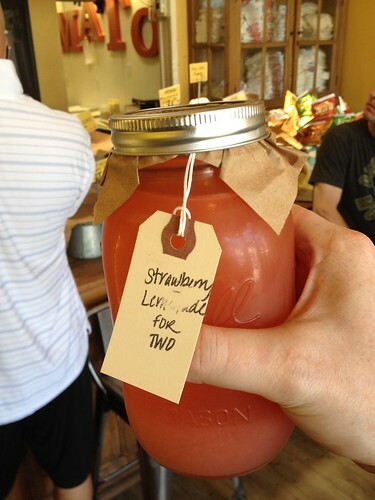 The housemade strawberry lemonade was the best strawberry lemonade I've had. I find most strawberry lemonade too sweet, but this was immensely refreshing without being either too sweet or too tart. 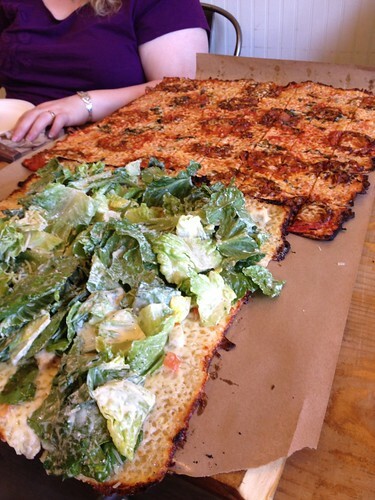 Chicken caesar salad pizza on the left, tomato-basil pizza on the right. The chicken caesar salad was tasty, but I found it too difficult to keep big pieces of lettuce atop small servings of pizza. The tomato-basil pizza was great, with strong bright flavors of tomato and basil. 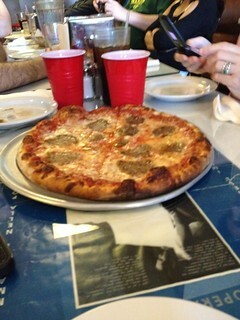 These two unusual pizzas were both outstanding. On the left is the "Harvest Moon" pizza, with brown sugar, butternut squash, sausage, caramelized onion, pumpkin seeds, and brown butter. It was very sweet, a bit oily, and delectable. 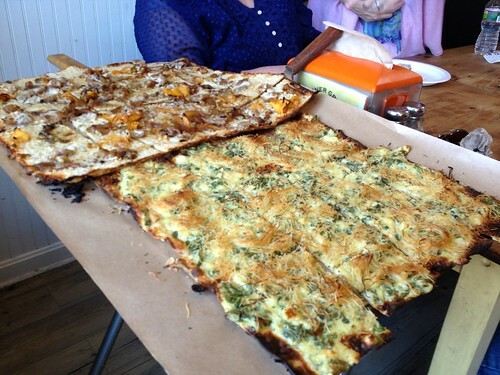 The pizza on the right is "My Yiayia's Pie", a spanakopita-inspired pizza with spinach, feta, and shredded phyllo dough. 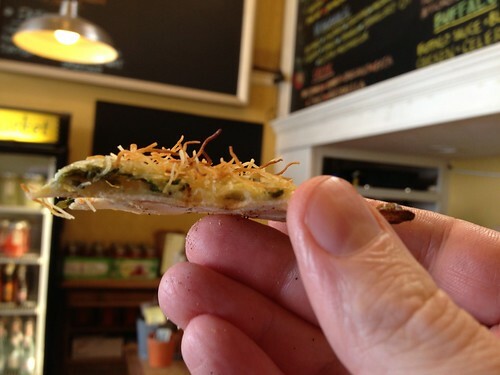 I liked this a whole lot more than I've ever liked spanakopita. 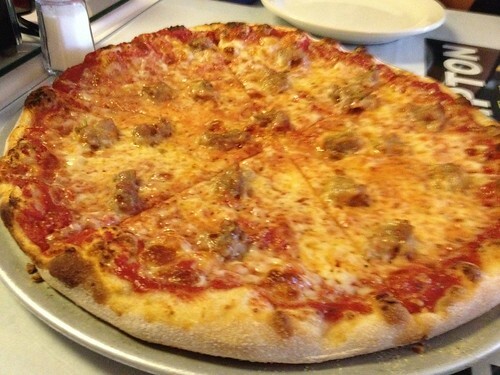 The Corner Grille's crust is among the thinnest pizza crusts I've ever encountered. 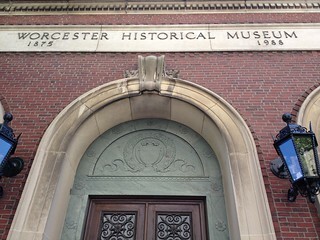 For another break for digestion, we went to the Worcester Historical Museum. I didn't have time to see everything; I didn't even see every room. I spent a lot of time looking at one case of "bizarre stuff that was given to the Museum before it focused specifically on history." Most memorable artifact: a lock of hair from a Revolutionary soldier that was clearly acquired through grave robbery. I had a lengthy chat with some of the staff about Irish temperance societies in and around Worcester. Irish temperance societies were mentioned in a brochure I read in Union Station, and my interest was piqued by a family story. The first time I had dinner with Lori's family, I inquired whether Catholics had a temperance tradition. After I answered their questions about the meaning of the word "temperance", Lori's father laughed and proclaimed, "We Catholics are forbidden to do many things, but drinking has never been one of them." 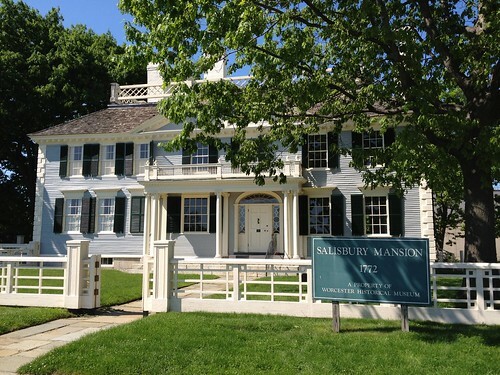 Salisbury Mansion was an interesting piece of historical reconstruction. I was interested in the stories of how they decided to restore it as much as the stories of what it was like originally. The booths are scarred by years of graffiti. 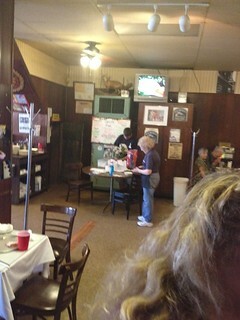 A sign asks patrons not to disfigure the booths, but that horse has left its barn. One of the art deco prints. 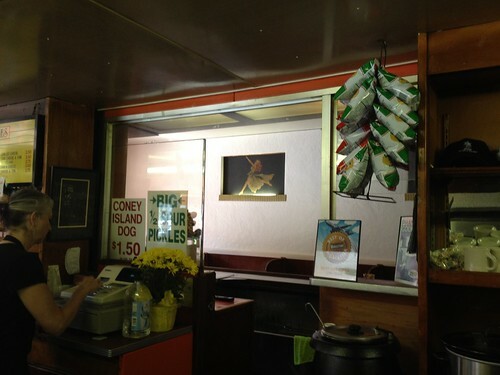 I can't recall previously seeing such a beautiful picture framed by a hot dog window. 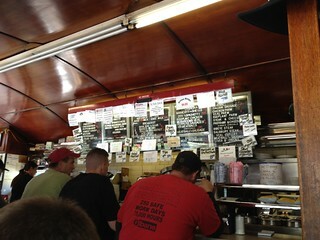 I was struck by the fact they served with real china and glasses made out of glass. 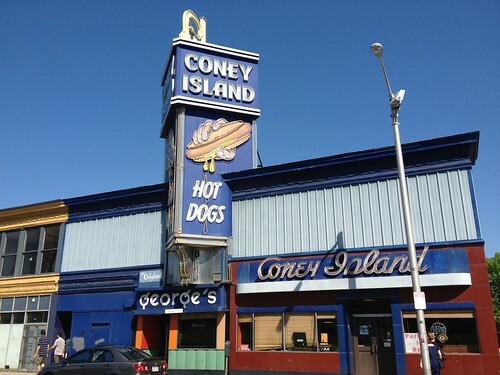 I can't think of other hot dog places that have done that. 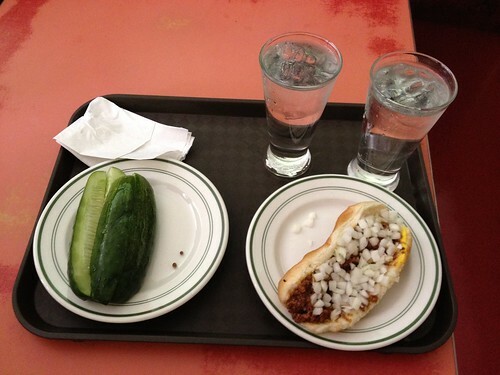 This was my first encounter with the Coney Island hot dog with mustard, chili, and onions. 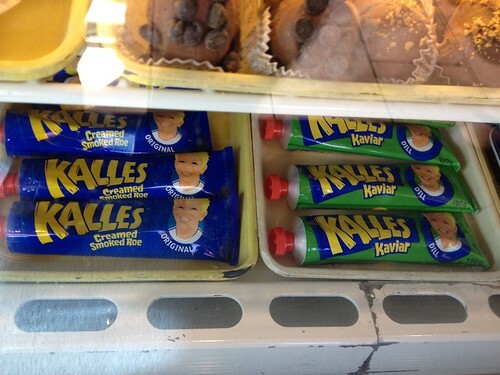 It was pleasant, but I mostly tasted the mustard and chili instead of the dog. The half-sour pickle put new emphasis on the meaning of "half-sour"; it tasted much more of cucumber than most dill pickles do. 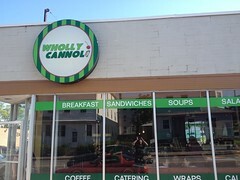 Wholly Cannoli was a modern-looking coffee shop with many beautiful pastries. 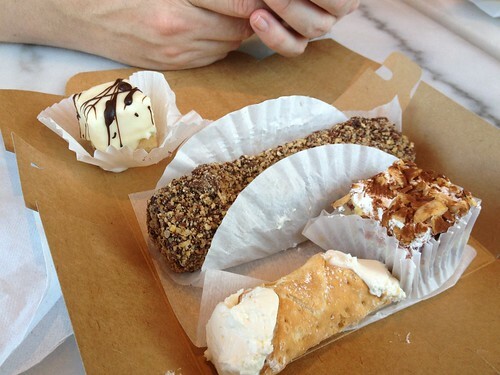 Karilyn recommended the dynamite, a combination of cannoli filling wrapped in chocolate. It was tasty, but it suffered from the layersquish problem: applying enough pressure to break through the chocolate caused the filling to spurt everywhere. The mini cannoli, though, managed to transcend the layersquish that's endemic to cannoli: the shell was delicate enough to break only where intended, leaving the rest intact. 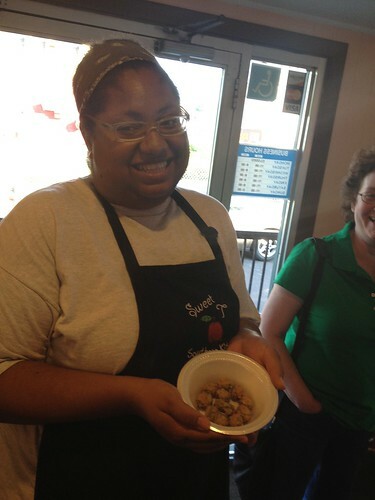 Our last stop together was at Sweet T Southern Kitchen, where Michaun and Tony made us tasty food. 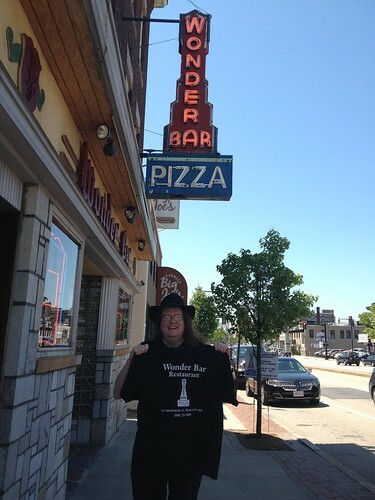 (Why is there a Southern restaurant in Worcester? Michaun had come to down for a tech job which had then laid her off, and she and Tony opened the restaurant because she missed Southern food and he could cook.) 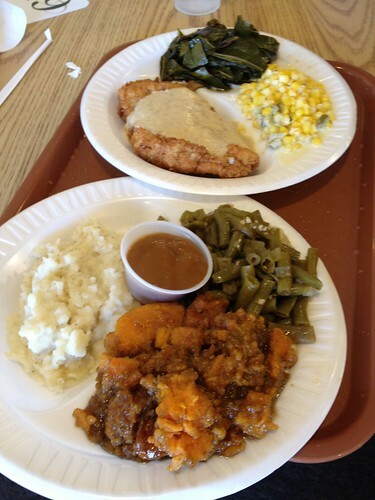 The highlight of my plate was the chicken-fried chicken; the highlight of Lori's plate was the sweet potatoes, which were as sweet as candy but managed to avoid the trap of being cloying. 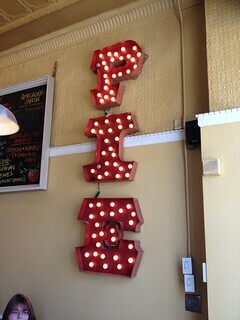 The buttermilk pie was also notable for a very bright, clear buttermilk taste. After our meal, Michaun brought out a bowl of fried okra, "because none of y'all ordered them". 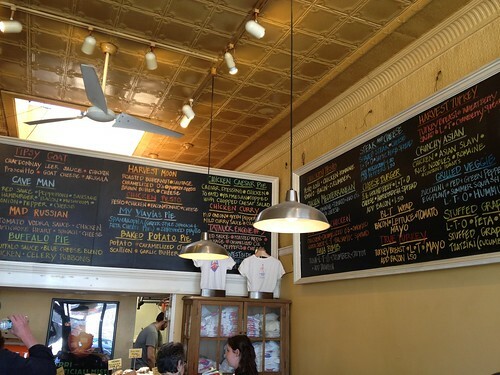 I cling to the belief that they weren't ordered because they weren't mentioned among the options, because I love fried okra and I think I would have ordered them if I'd noticed the option. These were piping hot from the fryer, and I popped one or two down greedily, but Michaun felt that more persuasion was necessary: "It's a deep-fried vegetable; what's not to like?" We enjoyed our day very much. We'd like to thank everyone, particularly Beth and Karilyn, who did an outstanding job organizing this. The itinerary was very clear, and there was enough time budgeted for every stop; I shall take this as a standard to try to meet for my own organizing attempts.